Prism, formerly Webrunner, installs Web applications on your desktop, on Windows, Mac, Linux.. This is a small version of Firefox dedicated to Web application as Analytics or others. An interface between the desktop on your operating system and the Web. Each application is physically represented by a bundle, a file that creates the link between Prism and the remote software. Update February 4, 2011: The project Prism is now abandoned by Mozilla and replaced by Chromeless. We can read in the press: "Webrunner, Firefox for a single Web site". In fact the exact opposite is true. It is an interface that avoids to launch Firefox to use a single website! And we have an interface for each site with an icon on the desktop, thus avoiding any further navigation on the site, and it allows to keep the environment of each Web application. A direct print function from the menu of Prism. Support for the download manager. And many others whose list is changing because the software being in development. Actually everything is in the installation. Once the application is installed, it becomes an icon on the desktop on which one click, as with any application installed on the computer, with the difference that we must be connected to let it running. It is not complicated to use, rather than installing software on the computer, Prism is installed and a bundle for an application. We then take advantage of all updates without any subsequent installation since that is done on the server. Download Prism in the version for your system (Windows, Mac, Linux) and run the program. Download the bundle that interests you (see at Mozilla on the link at bottom). Store it in the Prism directory. 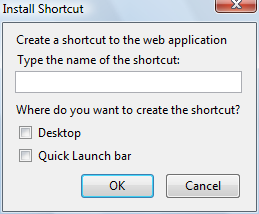 From Windows Explorer or any equivalent program for your system, click on the downloaded file, with a .webapp extension. In the lower right corner of window there is a gear that opens a menu, click on "Install to desktop". Give a name for the icon. Your application is installed. Thereafter, a click on the icon launches the application in a window dedicated to it, without toolbars and buttons as on the browser.Your login and passwords are stored for an immediate access. To create your own bundle, Mozilla gives instructions. Get your messages with Gmail. Your account on Facebook or Twitter. Webmasters will enjoy access to the tools of Googles for webmaster, and Analytics with a single click! You can make yourself a bundle for your own favourite applications. © 2007-2011 Xul.fr . First published October 20, 2007.